VOL. III NO. 1 REG NO. L5015 DELHI, THURSDAY SEPTEMBER 14, 1944. 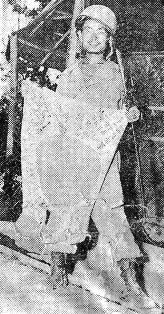 STRICTLY A PRESENT We quote the letter which accompanied the above contribution: "in the lonely reaches of Northern Assam, our Army Airways Communications System unit opened its mail one morning to find this highly interesting pin-up of Sherry Britton, N.Y. night club entertainer. We pass it on to the Roundup as our idea of what the post-war world ought to be full of, accompanied by a polite note to the editor to 'make damned sure' we get it back." The plan under which some part of the Army will be demobilized after the defeat of Germany has this week been announced by the War Department. Discharges will be made on the basis of the individual, rather than the unit, with preference accorded soldiers with overseas and combat experience and those with dependent children. PROMOTION Maj. Gen. Dan I. Sultan, Deputy CBI Commander, was nominated as lieutenant general today. 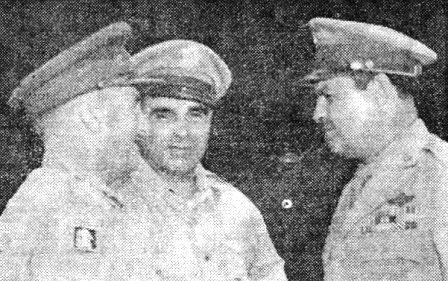 Dan I. Sultan, Deputy CBI Commander, was nominated to be a lieutenant general today; two brigadier generals - Frank D. Merrill, leader of the famous Marauders, and Gilbert X. Cheeves, Commanding General of Base Section 2 - were nominated for second stars; and Col. John P. Willey, Deputy Chief of Staff of NCAC, for his first. Senate confirmation is awaited for the four recommendations made by the President of the United States. Sultan received orders to report to CBI in November, 1943, and in the first week of January was appointed Deputy Theater Commander. Previous to arrival, he had commanded all units from a platoon to an Army Corps since West Point graduation in 1906. As Iron Man tackle on the '06 Point eleven, he played every minute of every game on the schedule. same manner as the rest of the Army, with the exception that in the case of all Army female personnel, those whose husbands have already been released will be discharged upon request. Although personnel now serving in CBI and the Pacific are covered by the discharge plan, it appears that soldiers now serving in the European Theater of Operations will be first affected. The War Department warns that as the bulk of Allied shipping will be used to transfer units to the Pacific Theater, even those now serving in ETO who are eligible may anticipate considerable delay in their return home. Following Germany's defeat ..will have to move combat groups and ground units from all over the world to the Pacific areas. The nature of the Pacific Theater dictates that Army Service Force personnel will be needed in great numbers. It is therefore expected that the reduction in the strength of the Air and Service Forces will be slow at first. The War Department's formula for orderly discharges was reached after interviews with thousands of servicemen in the U.S. and overseas. Opinions expressed by the soldiers have become the accepted principles of the plan. (4) Parenthood credit, giving credit for each dependent child under 18, up to a limit of three children. The value of the points credits will not be announced until after the cessation of hostilities in Europe. The total score will be used in the selection of surplus men from overseas theaters and the U.S. The score will also be used when a certain portion of these surplus men are declared non-essential and demobilized. To illustrate how the plan will work, assume that there are four divisions in ETO. One is declared surplus. Men in all four divisions are rated according to the credit scores. The top quarter is selected and those not essential for retention in service by reason of military necessity will be declared surplus. Men marked for retention will be shifted to the active divisions. The remaining inactive, or surplus division, will be returned home for demobilization as soon as is practicable. 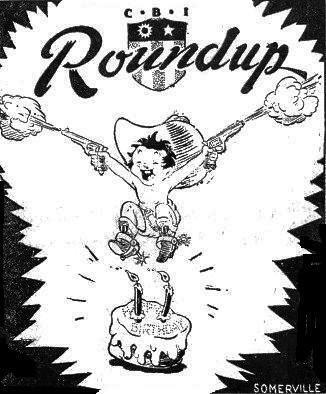 Congratulations to the Roundup on reaching its second birthday intact and still easily in the lead. No change in policy - the mission is still to make it a paper the soldiers like, in spite of occasional red necks and faces. keep them laughing; they'll furnish the growls themselves. In CBI and the Pacific areas, commanders will be told the number and types of men that can be replaced. These men will be selected, using the same standards that apply in inactive theaters and the U.S. These men will be returned to the U.S. as rapidly as replacements of the same type become available and the military situation permits. Troops now based in the U.S. will serve as the main reservoir of replacements for overseas theaters. Any man declared non-essential under this plan wishing to remain in the Army, providing he has a satisfactory record, will jot be forced out of the Army if he can usefully be employed. The War Department states that the size of the military establishment needed after the defeat of Germany has been calculated with the same exactness as the size of the Army needed up to now. No soldier will be kept in service who is not needed to fulfill these requirements. No soldier will be discharged who is needed. It must always be borne in mind that no peace will be enjoyed until Japan has been completely crushed. 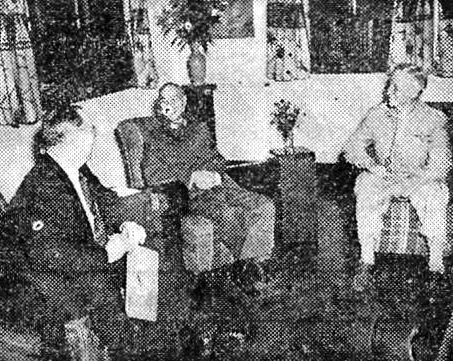 PRINCIPALS IN CHUNGKING CONFERENCE Aboard a Chungking-bound plane for a meeting with Generalissimo Chiang Kai-shek, Maj. Gen. Patrick Hurley and WPB Chairman Donald Nelson discuss plans with Gen. Joseph W. Stilwell, CBI Commander. Upon arrival at the Chinese capital, Nelson and Hurley begin conferences with the Generalissimo at his headquarters. Progress on the Salween Front, where Chinese troops are attempting to open the Burma Road for a linkup with Gen. Stilwell's forces in Burma, was steady this week as Sungshan fell; enemy forces in Tengchung were further compressed, and Jap relief troops futilely tried to break through to aid the besieged Lungling garrison. Sungshan, Gibraltar of the Burma Road, just west of the Salween River, fell after three months of continuous assault during which the 2,000 defenders were virtually exterminated. Only a handful of prisoners were taken, including five women. In one instance, the Chinese literally blasted the Japs off the top of their mountain fortress by planting dynamite under their positions. Tengchung found the Chinese holding 80 percent of the city, with the remnants of the 2,000-strong Nip garrison being compressed into the eastern corner of the walled city. The Japs made a sturdy attempt to break through to Lungling by pouring heavy reinforcements from the south. But the Chinese control hill positions along the Burma Road and the traffic on the Mangshih-Lungling artery. The Nips have been heavily attacking the Chinese positions but have made little progress, although suffering severe losses. Capture of Sungshan enables the Salween forces to move supplies down the Burma Road by truck. Strongly fortified by the enemy, it stood on a 7,000-foot peak, where the positions commanded the adjoining terrain. The Japs had held the town for two years. Equipment captured by the Chinese at Sungshan included eight pieces of heavy artillery, four pack howitzers, four anti-aircraft machines guns, four anti-tank guns, over 20 light and heavy machine guns, 350 rifles, four tanks, nine trucks, five tractors and a number of knee mortars. During the Sungshan siege, members of Brig. Gen. Frank Dorn's Y-Forces lived in tents scattered along the rain swept slopes of the Kail Kung Mountains, overlooking the Hwei Tung Bridge on the Salween River. An American hospital unit, under command of Maj. R. E. Pennington, set up quarters in the vicinity and operated on casualties. The 14th Air Force again air-dropped supplies to the attackers, including American raincoats to aid the Chinese in combating the monsoon rains. The Nip air force, on the other hand, faced continuous fire from Yank ack-ack batteries, which kept their pilots high. As a result, they constantly dropped supplies which fell into the Chinese lines more often than into the Jap positions. 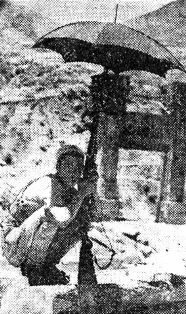 An important element in driving the Nips from their rat-like holes on the Sungshan mountainside were the American flamethrowers, previously used successfully by the U.S. Marines in the Pacific. 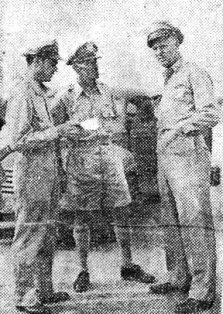 Before the Chinese took the flamethrowers into operation, they received instructions from American enlisted men and officers of the Y-Forces. STRICTLY G.I. By Ehret "BROADWAY HAS NOTHING ON THE CBI AREA WHEN IT COMES TO FIRST-CLASS SHOWS" - MOVIE MIRROR. The Allies were on the offensive all along the Burma front this week, with action finally flaring forth in the Arakan as the 14th Army dug itself out of the mud and attacked, according to British sources. In North Burma, the British 36th Division of Maj. Gen. F. W. Festing was progressing towards Katha, having reached Hopin in the face of negligible enemy opposition. In occupying Hopin, the 36th found the bodies of more than 500 Japanese dead; battle and starvation casualties. In the Kazu area, south of Myitkyina, Chinese troops continued patrol action. In the Chin Hills, the Japs have dug in behind strong defenses along the Tiddim Road. No further activity was reported from the Chindwin front with the Japs across the river and being hunted down in the jungles. The Arakan front broke a six-month lull, in which both sides have been idle while the monsoon raged. The British reported their forces launched a heavy attack in the midst of a pouring rainstorm on a strategic ridge. The Associated Press of India halted the advance of the British 36th Division, part of the command of Gen Joseph W. Stilwell, along the railroad towards Mandalay in North Burma as the outstanding action of the week. These tough British troops drove on from Pinbaw so swiftly and forcefully that the Japs made no attempt to man strong positions between Pinbaw and Hopin. TENTH AIR FORCE HQ IN INDIA - "Without the air support you have given us, we could neither have advanced so rapidly nor killed so many Japs," declared Maj. Gen. Francis W. Festing, commanding the 36th Indian Division, in a message of congratulations sent recently to Maj. Gen. Howard C. Davidson, Commanding General of the 10th Air Force, EAC. Fighter, bomber and transport planes of the 10th supported British, American and Chinese troops throughout the campaign to capture Myitkyina and it is continuing its work as the Army under Gen. Joseph W. Stilwell presses southward in Burma. "Thanks for the first class cooperation given us by you and your men during recent operations. Without the air support that you have given us, we could neither have advanced so rapidly nor killed so many Japs. Also, thanks to the Troop Carrier aircraft, as a result of whose efforts, no member of this division ever lacked food or ammunition, while many lives were saved by air evacuations." Brig. Gen. Frank Merrill, former leader of the fabulous Marauders, chats with two Nisei, T/Sgts. Herbert Miyasaki, left, and Akiji Yoshimura. CBI now has its own Sergeant York. He is S/Sgt. Kenny Yasui. Kenny is about five feet two and weighs scarcely more than 120 pounds. And this Baby York of CBI is a Nisei. Nisei means second generation. It is a Japanese word, but Niseis are Americans. Ten thousand of these American-born children of Japanese immigrants fight now in the United States Army and some in this Theater. Their presence in CBI was for a long time a military secret. For their own protection, they were not publicized. Some still have relatives in Japan who had to be considered, and then there always was and still always will be the possibility of capture by the enemy, which for a Nisei would mean no picnic. Under the veil of protective secrecy, however, the stubborn, sturdy fighting Niseis grew to the stature of heroes. They became exceedingly popular, earned the admiration and personal friendship of every private and general with whom they came in contact. The secrecy was officially lifted a few days ago. Now we can tell their story. The case of Sergeant Yasui, who captured 16 Japanese at the Irrawaddy River, is only one of the many bright spots the Niseis are writing into modern American military history. They fight for Uncle Sam in the Aleutians, in Italy, all over the Southwest Pacific, and all over the CBI. The most publicized Nisei soldiers are the men of the terrific 100th Infantry battalion in Italy. One thousand of the 1,300 men of the battalion have been wounded in combat and wear the Purple Heart. The unit earned 44 Silver Stars, 33 Bronze Stars, three Legion of Merit medals and many battlefield promotions. Since the birth of the battalion, there has not been a single case of desertion, not even a slight AWOL. The men of the 100th fought in Sicily. Near Cassino, they spearheaded the crossing of the Rapido River; at Belvidere, they outflanked the toughest German position and flabbergasted the Nazis they captured. In Rome, they went sightseeing, but soon after helped the Engineers to rebuild the port of Leghorn. To this Theater, they came more recently. 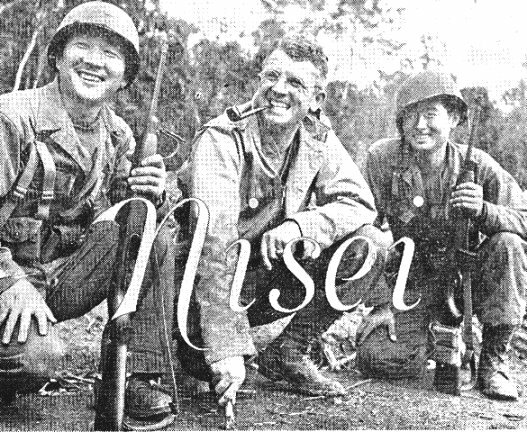 Our Sergeant Yasui, who crossed the Pacific some six months ago, was preceded by a tough and audacious bunch of his fellow Nisei who joined Merrill's Marauders. I met the Nisei Marauders just a few days ago when they were mounting a truck for a rest camp. Some were distinctly tall; all were well built. All looked gay, worryless, self sure, happy-go-lucky. Very American. This, of course, is no accident. Nisei grow about two inches taller and are far better built than their relatives in Japan. This is a scientifically-proven fact. The Jap is the son on an undernourished nation and looks it. The uncanny discipline and self-negation to which he is subjected from the cradle to the grave makes him tight, crampy; more a human automaton than a human being. But all this vanishes under the American sun. The Nisei feels, thinks, acts and moves about like his fellow Americans. And this alone is a great slap in the face of the Robber Empire and a sublime compliment to America. The Japs spent many a thousand yen before Pearl Harbor to "Japanize" their second generation in America. With money, scholarships, free vacations, they coaxed thousands of Nisei in the past 15 years to return to the Land of the Rising Sun for a little reeducation in the Japanese spirit. These Nisei they called Kibeis - the returned ones. And they gave them a hell of a good time. But they spent their money in vain. It was not so easy for a Nisei Marauder to kill his first Jap. "I had a terrible feeling," said a sergeant who doesn't want to be named, "when the first Jap I have shot collapsed and expired with a heartbreaking 'Banzai' on his lips, but my second shot came easy, the third even easier. I can't tell you exactly how many I have shot. It is very difficult to know in the jungle where everything melts into the background." Once these boys were in the fight, you couldn't get them out of it. When a Nisei Marauder was wounded or when he fell ill, he would hide his ailment until he collapsed on the spot. T/Sgt. 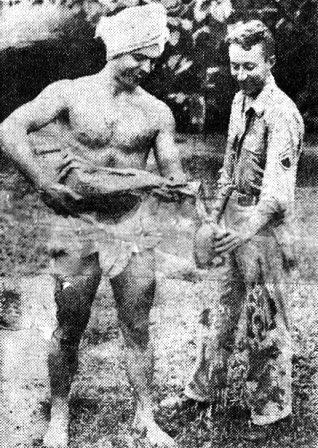 Tommy K. Tsubota, from Honolulu, suffered from a bad hernia during a forced march through the jungle. With small bamboo splints, he trussed his rupture, marched on through the thicket until he collapsed and had to be evacuated by air. Sgt. Henry Gosho, from Seattle, was very ill with malaria, but hung on to the tail of a mule and was able to drag himself through the campaign. Brig. Gen. Frank Merrill's Nisei Marauders proudly wear the sky blue citation ribbon of their unit, though three of them - S/Sgt. Russell K. Kono, from Hilo, Hawaii, S/Sgt. Roy Matsumoto from Los Angeles and Gosho - were cited individually. Other Nisei units in other parts of the Theater were men of the same mettle. Sgt. Eddie Sakaue, who was loaned to the British, saved the life of an English captain under fire. Then, of course, we have Baby York. It happened on the Irrawaddy River, during our mopping up operations after the collapse of organized resistance. A group of about 17 Japanese were isolated on an island. There was a call for volunteers to capture the Japs. Kenny Yasui and three non-Nisei Americans stepped out, stripped and swam over. Little Kenny took charge. "Kio tsuke! Hidari muke hidari! Mae susume." The drill over, Yasui solved the problem of getting the party across the Irrawaddy by having the prisoners swim, pushing a raft against the swift current. And on the raft sat Kenny with the sword in his hand and two of the weaker prisoners at his side. I happened to serve in Shangri-La in the same camp with Yasui. We were barrack mates and when we came overseas I was the only non-Nisei in a small Nisei unit of which Kenny was a member, too. So we came together to CBI, shared a lower berth up to the West Coast. In the embarkation port, Kenny taught me the famous Nisei three-dice crap game: 4-5-6. Kenny was the most intriguing gambler I have ever known. Back in our Shangri-La camp, he lost or won $500 a night as if it were two bits. The first night at sea, he sized up how much cash there was on board. The sum of it, he assured me, would be in his money belt before we reached India. And so it was. At the first Indian port, Kenny bought a sparkling star ruby and two star sapphires. And then he made a vow. He made up his mind to make $10,000 in CBI by gambling. We knew Yasui's aims, and we worried. We knew our unit would have an important job to do and such a ferocious little gambler might bring the whole team into difficulties. We discussed Yasui for hours and hours with our team leader, who was T/Sgt. Koji Ariyoshi, a Honolulu boy. Yasui gambled on, and yet the team leader wouldn't condemn him. "Wait, wait," Ariyoshi told us. "Watch how he'll turn out at the front. It's not always the ideal garrison soldier who makes a good fighter. Extraordinary people are capable of doing extraordinary things." We arrived in Delhi. We had about a week in town and looked around. The place teemed with G.I. 's and it was just after payday. Well, we thought, this was the day for Yasui. But Yasui stopped gambling and has never gambled since. he was willing to play occasional poker at low stakes, but he spent his free time in Chinese restaurants eating good food. he began to study war maps and followed with a sudden and genuine interest the course of the global struggle. He realized he was in a theater of war. He wanted to help. He wanted to fight. His life captured meaning. His mind pursued a task. The rest you know. My life among the Nisei was an exceedingly happy one. They surely will remain my intimate friends until distant times when this war will be but a memory. But I must confess: When I was detached from the unit for other duties it was in some ways a relief. It was a relief from a little too much discipline and from too good behavior. The average Nisei is a model soldier. He is aware of the burden of an unpopular ancestry, yet he knows that he is a good American and wants to prove it. Our team leader made our unit the best disciplined group at all staging camps we had to pass. We often had to march in formation when is wasn't absolutely necessary. Our carbines were the cleanest, our uniforms the neatest. We appeared on the minute everywhere we were told. To sum it up: They were too good for me. Still, my happiest moments in CBI are the days when I come across them from time to time at places often distant and remote. And I remember the long way we went together. 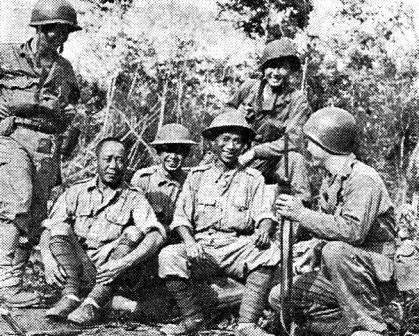 Col. Chun Lee, Merrill's Chief of Staff, pictured at left, introduces Yoshimura, center, and Miyaskai, right, to a group of Chinese soldiers in North Burma. I remember the midnight lunches in our barracks, when they cooked rice and spiced it with Japanese radish. Their faces were dimly lit by the burning stove. The scene could have been somewhere in Japan, but inside every shadowy figure the American flame burned and I seemed to see it all the time. An I remember them individually. Koji, the leader, was a Hawaiian longshoreman but worked himself up to graduate with honors from the University of Georgia. Kitsu, the dishwasher from Los Angeles, burned the midnight oil to read John Gunther's Inside Europe. Chris, the talented artist of the Walt Disney Studios, was able to express every thought by a quick and forceful sketch. Then there was young Kenjiro, who used to work on Nisei farms all over the Coast, and Sam whose dream is a mechanic's job in any plant anywhere in the United States. And there was Clarke, the man of the world and honor student at Harvard, and Kenny, the ex-gambler. And Alex, and lastly, Karl, a labor leader in San Francisco. Karl, 38, was the oldest of us. His name is a hallmark. It is believed by many oppressed, exploited, humble and starving farmers and workers in Japan. It is feared and hated by the Japanese police. The longshoremen of Los Angeles and San Francisco know him, also the fishermen of Seattle and Alaska. This man organized unions in Japan - was blacklisted by the Japanese police - suffered in Japanese dungeons. Back in his American homeland, he became a union organizer and also ran for Assembly in San Francisco on a labor ticket. The dizzy speed of events after Pearl Harbor temporarily called Karl from the waterfront into a relocation center for Americans of Japanese ancestry. From there, Karl volunteered to fight for the U.S. Army for a better world in which his son may live as a free man. The British had known all along that Americans believed the jeep could do anything except fly, but it remained for T/5 Jack E. Graham, now in the CBI, to show our Allies that Yank belief amounts to more than verbal tribute. Graham did it by trying to climb the highest pyramid in Egypt aboard a jeep. He never got to the top, but that wasn't his fault. He and his compatriots were sitting around camp one night, listening to a British broadcast and downing Egyptian jingbao juice. Over the air came a statement that the Eighth Army had a man who had driven a golf ball over the pyramids. "We decided if the British could drive a golf ball over the pyramids, we could drive a jeep over," recounts Graham. "So we set out to prove it." The "Yank Gurkhas" had no trouble finding the pyramids. They successfully maneuvered the jeep through the corridor in the center of the Sphinx and prepared to mount what they judged to be the highest pyramid. Graham remained at the wheel and the other adventurers piled out and began to bank the steps with sand so the wheels could get some purchase. The jeep and the 200 pounds of chubby-like Graham had actually gotten up three of the steps when British GMP's arrived on the scene. When the astounded Britishers found out what the Yanks contemplated, they withdrew and held a conference. The G.I. 's merrily returned to their pyramid project. "But the British sergeant came back." sorrowfully explains Graham. "He told me, 'Sorry, Yank, but you can't climb the blinkin' pyramid, you know. It's not official business.'" When Graham's C.O. heard of the incident, S/Sgt. Graham became Pvt. Graham - and he also lost his jeep. Graham plans to take advantage of Congressional promises that G.I. 's will have priority on purchasing jeeps after the war. "Might get back to Egypt at that and climb that blankety-blank pyramid," he says. TENTH AIR FORCE HQ. IN INDIA - Gunga Din comes to life here in Rudyard Kipling-land in the form of an American soldier, with a duplicate first name and a similarly pronounced surname - S/Sgt. Gunga Dean, of Oklahoma and Washington, D.C. He was named Gunga by his father, a World War I veteran, and there is more to the story than a mere coincidence of names. Young Dean has some American Indian blood in him; Kipling's "regimental bhisti Gunga Din" was all East Indian. The American Dean was born in Agra, Okla.; one of the most famous cities of all India - the home of the famous Taj Mahal - is Agra. Kipling said of the historically famous water boy, "You're a better man than I am, Gunga Din," and that statement can well be echoed in favor of his modern counterpart, who is a radio operator for a Signal company of the 10th Air Force, Eastern Air Command. Dean has been stationed in the jungle of India and Burma for 32 months and he has, too, had a taste of "the bullets kickin' dust spots on the green," although not the way Din had. The American has had to hit slit trenches because of enemy planes overhead, and what kicked up dust spots were fragmentation bombs and shrapnel rather than mere bullets. The new Gunga "Din" is 24 years old, the son of Mr. and Mrs. Emery E. Dean, of 303 59th Ave., Capitol Heights, Md. His father, now a civil service employee, was a machine gunner in France in World War I and his closest buddy was an American Indian who devoured Kipling and was always quoting from Gunga Din. The elder Dean was impressed with the poem and told his buddy, "If I ever have another boy, I'll name him Gunga." Gunga Dean can speak some Seminole Indian and some East Indian. During his term in India, he has had a lot of fun dressing as a native, squatting in the approved Indian fashion and giving off with some of the lingo. What with the sun and the normal color of his skin, which is a bit bronzed as a result of his touch of American Indian blood, he looks pretty much like an East Indian when he goes into his "act." ALONG THE LEDO ROAD - It was movie night at the huge, jungle-bound ampitheater in Northern Burma. Somehow, it seemed particularly peaceful. Not even an owl hoot or monkey jabber disturbed the calm. Presently there was a creaking, cracking sound at the rear of the area. The intent audience listened with ears cocked. Was a huge tree ready to fall? Was it a sneak attack by Japs? Suddenly, a jittery joe bolted out of his seat. Others followed. A mild panic ensued as the yelling troops rushed through every available exit. Even made some that didn't exist. Next morning, faces were bright red, as blushing G.I. 's found that a falling branch had caused the incident. But one man was missing. A hasty search failed to locate him. In the afternoon, patrolling MP's noticed a strange sight at a nearby stream. They detected a single figure, peeking cautiously from a camouflaged fox hole. Approaching to investigate, they found a sheepish G.I. who asked if everything was clear. He had rushed off the night before, dug a foxhole with his bare hands and decided to stay until the Jap threat had been removed. One of the precious characters who does his stint in the Roundup office this week opened a small package from his girl. It was a CBI patch of neon-light brilliance, of a design now being made Stateside. 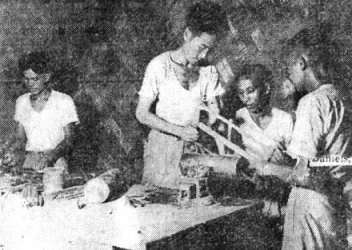 Wounded Chinese veterans learn a new trade in the tinsmith shop at the Rehabilitation Center. These veterans are sawing a 105mm shell casing in two. It will be flattened out to make ash trays, name plates and other practical items. ALONG THE LEDO ROAD - The sign says "Rehabilitation Center." Trucks that roar through mud and dust over the highway that Brig. Gen. Lewis A. Pick's Engineers built across Assam's Patkai Hills into Burma never stop there. But to thousands of wounded Chinese soldiers, that sign by the jungle clearing spells New Life. There, paralyzed arms and legs learn how to function again. There, men with amputations are taught handicrafts which will make them self-supporting at war's end. Started April 1, 1944, the Rehabilitation Center is a pet project of Gen. Joseph W. Stilwell. The Chinese soldiers who made the return trip into Burma with him are Uncle Joe's boys. He knows them backward and forward, inside and out. And he is just as enthusiastic in praise of them as they are of him. For a long time, Stilwell had wanted something done for the maimed soldiers who pushed the Japs south through the Hukawng and Mogaung Valleys. Selecting a pleasant site far from the front lines, he placed Lt. Robert C. Beilke, of Green Bay, Wis., in charge of the project. Beilke was an ideal choice. A product of Yale University's Chinese language course, he also had a college major in psychology. Besides, he had spent months in the forward areas as liaison officer. He had slept, eaten, fought with the same men who would be admitted to the camp. Assisted by medical officer Maj. Lee Tye Shan, he went to work. The old Army supply problem reared its head. But soon loads of bamboo and leaves for thatching began to arrive. Garo laborers moved in and things began to hum. Sleeping bashas, mess halls, latrines, shower rooms and kitchens had to be built. All buildings are mosquito-proofed with Hessian cloth walls, netting at doors and windows. Nine workshops will shortly be in operation. In those already finished, the Chinese are busy weaving baskets, making sandals from salvaged parachutes, turning out tables, chairs and many other items which will be offered to G.I. 's looking for souvenirs or home comforts at small cost. Another interesting aspect of the camp's program is a reading and writing class for illiterates conducted by a trained Chinese civilian school teacher. Soon a course in Braille will be open for the blind. Putting 1,000 Chinese characters into "touch-system" terms is a matter for the experts. A hoard of doctors from a nearby hospital decides which of their discharged patients will be admitted to the camp. During his stay there every man is closely watched by Maj. Lee and Lt. Beilke. The moment he becomes proficient at a craft, he is flown back to Free China. All over the world, casualties of war are being helped to make a readjustment to civilian life. It is gratifying to know that even in the remote outposts of the Indian jungles, Chinese soldiers who fought so gallantly to retake Northern Burma can now look into the future, Independent and unafraid. Maj. Gen. Curtis E. LeMay, right, puffing on a pipe, is greeted upon his arrival to take over command of the 20th Bomber Command. Center, Brig. Gen. John E. Upston, Chief of Staff, and, left, an unidentified British general. CHINA - A powerful force of American Super-Fortresses, under the personal command of Maj. Gen. Curtis E. LeMay, struck Japanese industry a sharp blow this week when the steel center of Anshan, Manchuria, was bombed for the second time. LeMay, commander of the 20th Bomber Command was flying his first announced mission since his arrival in China. The raid was accomplished in daylight, making visual bombing possible, and observers reported results were good. No heavy flak was encountered and at least seven Japanese fighter planes were destroyed, with ten more probably shot down and 11 damaged. One B-29 is missing and presumed to be lost. LeMay, who recently succeeded Brig. 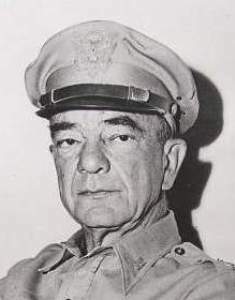 Gen. Kenneth B. Wolfe in command of the 20th, comes to CBI from ETO where, for two years, he directed the activities of a heavy bomb group in operation against Occupied Europe. The general, who will not be 38 until November, was born in Columbus, Ohio, and is a graduate of Ohio State University. He was graduated from Kelly Field in 1929 and shortly thereafter received a permanent commission. He transferred to bombardment work in 1939 and flew to South America as a navigator with a group of B-17's. In 1941, the general flew as co-pilot in a Liberator on a 26,000-mile survey trip from South America to Iraq. Early in 1942, LeMay formed a heavy bombardment group which he took to England and led in missions to Wilhemshaven, Regensburg and Bordeaux. He holds the DSC, the Silver Star, and the British Distinguished Service Cross. NEW HAVEN, CONN. - Chinese girls are teaching the language of their country to men who are about to go overseas. One of the instructresses is Miss Vee Ling, who nursed civilians in Shanghai, when the Japs attacked in 1939. She is a member of the class of "informants" as the girls are known. Situations as they exist or may exist in the CBI Theater are used by the Army to aid the men in assimilating and practicing the Chinese language. At a recent graduation exercise two fliers parachuted from the skies, conversed with a man supposed to be a Chinese farmer (actually one of the "informants") and found their way to the nearest friendly territory. Really as beautiful as they say? We had the Ledo Road to build. Fakirs, rope tricks and all of that. I tended the wounded, buried the dead. The loveliest building of them all. Didn't you see a single thing? Those are the only sights I've seen. There was a memorable meeting in the Roundup office this week between Sgt. Smith Dawless and S/Sgt. Karl Peterson. Ye Ed had called in Dawless, the "Bard of Assam," for the purpose of capturing his classic features on Signal Corps film. 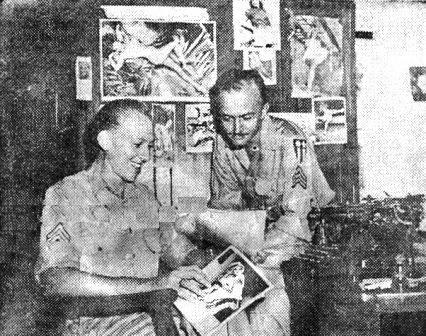 The reason was the Dawless' Conversation Piece, first published in the Roundup, was judged by Army Times as the outstanding soldier poem of World War II and was widely reprinted by newspapers from coast to coast. It was the first time Dawless and Peterson had ever squeezed paws, although they had been separated by only 50 miles at their last stations in the weeds before being transferred to Little Washington. Dawless now toils manfully in the Historical Section and Peterson for the Roundup, but it was not always thus. Dawless, 36, with thinning red hair, freckles playing tag across the bridge of his nose and slight of build, shipped to CBI-land with a group of medics on March 3, 1943. He admits that his first poem, The Naga Headhunter, was written so that he could inform his folks of his whereabouts. "Thereafter, however," he confessed, "the poetry writing bug hit me." Twice a month, sometimes oftener, the Roundup published his literary efforts and claimed him jealously as its very own. Beardless, 25-year-old, uninhibited, flaxen-haired Peterson, self-confessed corn merchant, was for many long months a contributor from the brambles. He shipped for Java as an operations clerk with a fighter group on Jan. 12, 1942, and wound up at Karachi because the Japs had other plans about Java. By simple arithmetic, that adds up to 32 months a CBI-lander, some haul, chum. And mostly in the tall timber. Our man, Pete, first contributed one of his many vignettes to the fourth issue of this little family journal. Strictly for chuckles - yours as well as ours - we called him into the office a couple of months ago to bang one of our Remingtons. "I wrote it for those fellows who are building the Ledo Road. I tried to dramatize the way they feel about it. Damn it, watching them fight the weather, jungles, mountains and all the other plain hell they've had to go through. I realize it's really small tribute. They're doing a heart-breaking job that will never be erased from the memory of anyone who has ever seen them in action." When Brig. 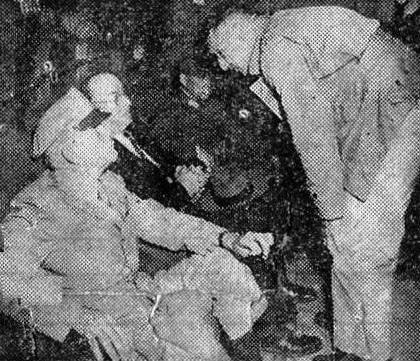 Gen. William H. Tunner, right, arrived to take command of the India-China Division, ATC, he was greeted, by Brig. Gen. Thomas O. Hardin, center, who he succeeded. Capt. Gerald Smith, Hardin's aid, left. Tall, well-knit, West Pointer (class of '28) Brig. Gen. William H. Tunner this week arrived to command the India-China Division of the Air Transport Command, and the ATC bid farewell to Brig. Gen. Thomas O. Hardin, who left CBI-land to carry out an important, although yet undisclosed assignment. In making this announcement, ATC officials also disclosed that the India-China operation, formerly a wing, was reorganized as a division about a month ago. Tunner, native of Roselle, N.J., brings to ATC operations in CBI - accented by the flying of the Hump - a wealth of experience. before coming to this Theater, he commanded the Ferrying Division of ATC, which under his direction, boosted 1943 foreign deliveries by 600 percent over its 1942 mark, flew safely more than $4,000,000,000 worth of urgently-needed warplanes and ran up a total mileage of 110,000,000 miles, equivalent to more than 10 daily trips around the globe at the equator. In June, 1941, Tunner, then a colonel, was transferred to Washington for duty with the Ferrying Command, predecessor to the ATC. He was C.O. of the Ferrying Command's Domestic Wing until its reorganization as the Ferrying Division of ATC. 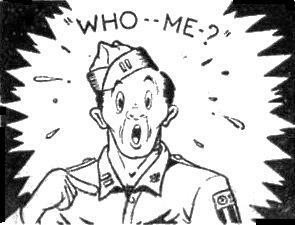 As commander of this division, he was promoted to brigadier general on July 4, 1943. Just before his departure from the States, Tunner was awarded the DSC in recognition of the development of the Ferrying Division. He was already entitles to wear the Air Medal for pioneering ATC's ferrying route across the Azores. Education-minded soldiers in CBI made 1,208 applications for courses from the newly-established CBI "A" Branch of the U.S. Armed Forces Institute in the month of August, reports Capt. Casper O. Dahle, Theater Education Officer. At this rate the branch would serve 10,000 G.I. 's a year. The figure nearly doubled the 594 applicants in July, and showed about 75 percent of them requesting ICS correspondence courses, 182 applying for the "self-teaching" courses and 51 requests for University extension courses. The unusual degree of interest in CBI in the Army's educational program was indicated some time ago in a research questionnaire, which announced projected plans for a USAFI Branch in the Theater and asked G.I's if they would be interested. Forty-six percent of those questioned answered, "Yes, I'm sure I'd be interested." Formation of the CBI Education Department in the Special Services office was approved by Gen. Joseph W. Stilwell late last year, and the Theater branch of the U.S. Armed Forces Institute opened at APO 465 (Calcutta) on July 1, 1944, with Capt. E. F. Gerold, Jr., as Commandant, Capt. Don R. Torrey as Registrar, and with an operational staff of nine enlisted men and seven civilians. Valuable aid in setting up the Branch, one of seven USAFI branches now overseas, was received from Base Section No. 2, local SOS unit, but shipping delays of teaching materials and literature sent out from the States have hampered the program. Additional shipments of course materials are now en route, however, from USAFI Hqs., at Madison, Wis.
Three types of courses are offered, available to both officers and enlisted men. Correspondence courses in 57 subjects, mostly on high school level, are presently available in CBI, the students submitting completed lessons by mail. These are graded and annotated with helpful instructions by selected teachers in the civilian university at APO 465, and by a part-time staff of 35 G.I. instructors now helping in the work. Enlisted men pay $2.00 fee for the first course, either correspondence or self-teaching, with no additional charges for further courses as long as satisfactory work is done; officers pay the full enrollment fee for each course, prices of which vary. With "self-teaching" courses, the student has all necessary material furnished him in one or two books and takes a final test administered locally by some officer on completion of the subject. Thirteen subjects including English, mathematics, physics, radio, typing, shorthand and bookkeeping are offered. Both the "self-teaching" and the correspondence courses, the latter including mathematics, science, business, mechanical engineering and drawing courses may be applied for credit towards Stateside schooling, and certificates of work completed will be forwarded by USAFI to any institution or organization the student may designate. University extension courses are offered by 85 colleges and universities in the U.S., Canada and Hawaii affiliated with the Institute. Lesson reports in this case are submitted by mail to the school concerned. For enlisted men the Army pays half the contract price of the course while officers pay the full cost. In addition, Special Service offices throughout the Theater are encouraged to form classes for local group instruction in subjects desired by sufficient numbers of men. Qualified G.I. 's, mostly ex-teachers, will act as instructors after being approved accredited by the Branch. Course will be offered in the "self-teaching" subjects and an additional subject to be announced later, plus a few foreign languages and a radio code course. Details of the USAFI educational program in CBI are contained in an informational bulletin published by the Branch at APO 465. WASHINGTON - (ANS) - American Army casualties in the first 25 days of the invasion of Northern France were about half the expected losses, Secretary of War Henry Stimson said this week, pointing out at the same time that the bulk of the German armies in Western Europe seem insufficient to maintain the prolonged defense of Germany. Stimson placed U.S. Army casualties in all Theaters through Aug. 21 at 305,795, including 57,677 killed, and 156,933 wounded. He said that 63,986 of the wounded have been returned to duty. Army figures raise the overall U.S. total to 365,759, with Navy, Coast Guard and Marine casualties of 59,964, with 23,926 dead and 21,894 wounded. EAC HQS., NORTH BURMA - Sgt. Robert A. Ferrier, aerial photographer with the Third Tactical Air Force, EAC, can boast what is probably the closest close-up picture of an exploding land mine. DING HOW Something new in military equipment - the rifle-umbrella. A Chinese soldier on guard near the Hwitung Bridge over the Salween River shades himself from the hot sun. Ferrier got his close-up while flying with a B-25 squadron, blasting railroads deep in Burma, and flying at extremely low altitudes. As the sergeant's plane made a sweeping hedge-hopping run down the badly-bombed track, a Jap land mine suddenly exploded directly beneath the photographer's rear hatch opening, splattering the bomber's fuselage and wings with big chunks of earth and metal and throwing the plane about like a cork in a stream. Returning to home base, the crew discovered just how narrow their escape had been. Both wings had been ripped open, engine cowlings shattered, one oil line severed and numerous dents and holes in the fuselage. And Ferrier, who first learned his combat photography in the Mediterranean Theater, has it all on film. "Then the flight proceeded to the alternate target," read three consecutive mission reports of the Golden Tiger Squadron, 10th Air Force, EAC. Off hand, one might think that the flight had trouble locating their primary targets. Actually, however, the precision bombing of Capt. Armond O. Erdman was the reason. In all three missions, a bridge was the target of the day. Each time, Erdman, spearheading the attack, demolished the structure with direct hits and obviated the necessity of the remainder of the planes using their bombs. Sharp-shooting Erdman's best day came recently when he destroyed the Namkwin Railroad Bridge, vital span leading into the Mogaung area. Last week, Roundup readers heard of the splendid combat work being done by the CBI War Dog Detachment, under its commander, Lt. Charles Fallon, who furnished us material for the story. Now, however, some new information has come direct from the North Burma battle area comprising the dogs' side of the story, which, while not refuting the previously published facts, reveals hitherto unknown information and a new understanding of the woes of a dog's life. Credit for this scoop goes to our suave Ice Cream, Ledo Road and Dog story editor, Pharmacist's Mate Second Class Thanatopsis Crestfall, who has been on field duty in recent months. "Crusty" Crestfall, as he is affectionately called by his fellow staff members, is rara avis, a Navy man on DS to the Army. His status has actually been considerably disputed, and he has been a bone of contention between the services, the Navy insisting that "Crusty" is really in the Army, and vice versa. In a brief 1,100-word editorial note accompanying his story, our informant answers the not unnatural question of how he communicated with the dogs to obtain his data. Seems he was idly watching two of the soldier dog handlers putting their charges, one big dog and a little one, through a number of simple tricks. 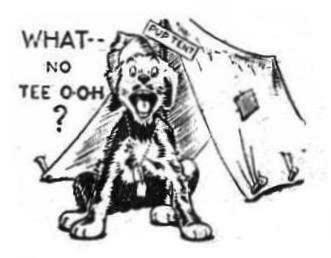 As they finished, the smaller dog turned to "Crusty" and announced, "That's all, brother," whereupon the correspondent, figuratively floored, breathlessly inquired of the G.I., "You mean that little dog can talk?" "Naw," was the bored answer, "The big dog's a ventriloquist." Sensing a scoop, the newshound quickly cornered the talented pooch, a cross between a Collie and a Boston bull with big ideas, an obtained an interesting insight of a career in the K-9 Corps. "The work's O.K.," said the talking dog. 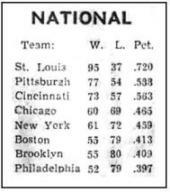 "But the gang's morale is no good. Morale, you know, is a lot of little things. I've been in grade for a year and a half, and if they don't give us a T/O soon, it's over the hill for me." Questioned about the chow, our unhappy dogface winced at the mention. "If I never see another serving of that damn dehydrated horsemeat," he said, "it'll be too soon. Every day, sometimes twice, and three times a day even, the same thing. Fried, boiled, stewed, fricasseed, it's still the same. These Army cooks - grr!" "The Army life's all right for these young pups," he went on, "but me, I'm an old dog. I'm a pre-Pearl Harbor father; I've got no business being here. Why, I've got a three-week-old litter back home that I've never seen." The Roundup operative at this point inquired what "Charger," as the dog is officially called on his service record (his buddies call him "Old Cold-Nose Charger") thought of the War Dogs story in the paper. "Great stuff," he replied. "It's time this outfit got a little press space. We lose out in these regular line units, and all the public hears about are those glamour outfits like 'Roger's Rovers,' that Marine gang in the South Pacific." "Charger" told for the first time of unsuccessful attempts to employ war dogs in the Middle East during the El Alamein fighting. "They service-tested some of our dogs there," he said. "But they couldn't work. Just ran wild over those treeless desert wastes as if looking for something and let their duty got to hell." "Our handlers are a great bunch," reported "Charger," as our reporter folded up his shooting stick preparing to depart. "They seem to understand everything we say to them. Sometimes I think they're almost canine." "As for India, it's tough, but I'd rather be here than back in the States as a warplant watch dog, on one of those soft, draft-deferred jobs. What we think of those mangy curs you couldn't print. Some of our boys are due for rotation already, and I've just got six months to sweat. Might even get out sooner with all the discharge points I've got piled up. Not much service, but I've seen combat, and boy, have I got dependents! My great grandpop was a regular wolf, and it seems to run in the family. Before I was inducted, I was quite a gay dog." SO YOU WANT TO WRITE FOR US? So you want to be a newspaper writer? Just scour your neck of the Theater for news in the approved Winchell manner, fire it along to the Roundup office via APO or the nearest available bullock cart and Ye Ed promises to accord it due consideration for publication in our little family journal. Naturally, we won't guarantee to publish every story you contribute, but we'll wager that a large number of your journalistic nuggets will glitter from the pages of the Roundup. By-lines, of course, are SOP. One word of warning, however. We don't as a general rule publish articles of purely local interest - such as the opening of Red Cross Clubs, unit dances and the promotion of your C.O. You can understand why. Your immediate area will be interested, but the remainder of this wide-flung Theater will yawn mightily. And our T/O is completed if you aspire to a transfer to the staff. But we'll know you through your journalistic efforts and, when an opening comes, you will be in on the ground floor. A USO troupe of six Broadway showgirls has arrived in CBI for an extensive Theater tour of songs, dances, skits and other little things calculated to gladden the G.I. heart. According to special service, this show will not flit out of the Theater after a few performances, but "will stay the distance, barring unforeseen accidents." Penny Bancroft, of New York City, is troupe manager and Georgia Lloyd carries the musical load on the piano. Los Angeles' Ann MacQuarrie, a tall, slender blonde, and gorgeous brunette Pat Flynn sing some snappy numbers from recent Broadway reviews, while Rose Marie Volin and Gigi Gilpin do the dancing. The girls will play a three-night stand at most stops, presenting a variety show the first evening and a musical quiz show the second night. On the third night the play, "My Sister Eileen," will be given, with the aid of local G.I. 's recruited to read parts in the script. T/5 Paul W. Benson, former Broadway press agent now with Special Service, is advance man for the unit, lining up the soldier talent. Coming on a troopship via the Pacific route, the gals had a long, rough trip en route to India, and arrived unheralded in New Delhi, where they had to bunk in an empty ward at the station hospital their first night in town. With two girls temporarily hospitalized, the short-handed troupe gave New Delhi men a brief but spicy performance. Well received were Annie MacQuarrie's rendition (with gestures) of I'm Just a Girl Who Can't Say No from the musical Oklahoma and Pat Flynn's I Want to Get Married from Follow The Girls. Rose Marie Volin did some sharp work in the tap-dancing department, after which Gigi Gilpin starred in a neat satire on the Stage Door Canteen. The most active Eastern Air Command aircraft during the week were B-25's of the 10th and Tactical Air Forces, which attacked enemy strong points throughout Burma. The Mitchells ranged as far east as the China border, dropping 1,000-pound bombs on various points along the Burma Road and demolishing a Japanese headquarters at Manwing. In the Fourth Corps area, these medium bombers scored repeated successful strikes against Mawlaik and other targets along the Chindwin River which were also heavily attacked by dive-bombers if the Tactical Air Force. A flight of Mitchells scored three direct hits on the railroad bridge at Kyaukse and on the same mission destroyed a bridge at Yeu. The latter was left with a 60-foot gap in its center and with 30-foot sections on either side of the break sagging in the water. Indaw, a key objective along the Mandalay-Myitkyina Railway, was bombed by several flights of B-25's with good results. bad weather throughout the week held down the number of sorties flown by other 10th Air Force aircraft, although P-47's bombed and strafed Myothit and Bhamo. Liberators of the Strategic Air Force dropped a substantial tonnage of bombs on the railroad stations and jetties at Moulmein and followed this, two days later, by an extremely successful mission against the railroad station and locomotive depot at Hnohnpladuk on the Burma-Siam Railroad. To adopt a hoary observation, THE ROUNDUP HAS NOW SEEN EVERYTHING. The Editor in Charge of Zanyism is calloused to improbabilities, but even his sleepy eyes bugged out so far that you could knock 'em off with a kukri. A zootsuiter in China yet. The accompanying picture, sent by Pfc. Louis Barton, is proof positive that we'll not knock 'em off with a kukri. The character is Capt. A. W. (Zootsuit) Lewis, a highly-respected member of the Chinese-American Composite Wing ... and our only explanation for his puckishness comes from Barton's caption material which tells that the cap'n has been 16 months overseas. "Neither heat nor rain can stop our gang," declares Barton, who announces that the unit has knocked down 86 Jap planes over China. Col. A. W. Bennett, C.O. of the hard-hitting outfit, is hiding Lewis from the Section Eight Board. NORTH BURMA - They tell the story here of Maj. Gen. Francis Wogan Festing's first meeting with Gen. Joseph W. Stilwell. Four-starred Uncle Joe looked up from his chair at the commander of the British 36th Division, whose huge, raw-boned bulk filled Uncle Joe's tent. "Sir," asked Festing, "what are my orders?" Stilwell was as laconic in answering, "Take Pinbaw." Without further ado, Festing moved toward the door to carry out the command and that would have ended the conversation had not Stilwell recovered from his surprise to hail him back. Whether the interesting story is true or not, it was not long until Festing's 36th Division, first all-British force to serve under Stilwell, captured Pinbaw; and it has now moved south along the Mogaung-Mandalay railroad to Hopin, where they found 500 Japanese dead. By European standards, the advance of Festing's division has been slow, but at the outset the British troops had to make their way through marshland and tall elephant grass through a drenching downpour. Then a period of intense heat followed which caused numerous cases of heat exhaustion. Finally, another spell of rain again turned the combat area into swamp land. Early this year, after distinguished service in the Madagascar campaign, the 36th moved to the Arakan front, where it preventing the cutting of the Bawli-Razabil Road. Later, it cleared the Tunnels Road on the Imphal front and captured several enemy strongpoints. Festing's home is at Simonburn Cottage, Humshaugh, Northumberland. He is interested in all field sports, especially hunting and fishing, but perhaps his main hobby is sailing and ocean racing. He has owned his own yacht for some years and in 1933 assisted in sailing the Jollie Brize across the Atlantic. On Aug. 28, Festing was 42 years old and observed a unique birthday party, a dinner given by a local headman in appreciation of his capture of Pinbaw. A poker-playing, swashbuckling soldier, with intense personal courage, Festing owns a Jap officer's sword. He killed the officer personally. 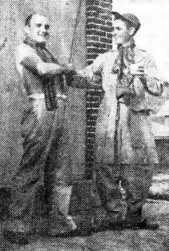 BURMA - Serving together in the same squadron of the "Earthquakers" Bombardment Group of the USAAF, operating with the Third Tactical Air Force of EAC, are two B-25 pilots who a short while ago flew with the RCAF. One is Lt. Edward Yont, who joined the RCAF in 1940, and the other Lt. Gordon K. Jones, who entered Canadian service in 1941. Both have seen action in Egypt, Africa, Tunis, Sicily and Italy. Capt. Marcus O. Shivers, administrative officer at an Air Depot in India was recently accused by a tonga wallah of the following, according to the base fishwrapper, Slipstream. Running amok with a 6x6. Attempting to destroy a native village. Swimming at night, sans clothes, in a crocodile-infested river. Departing with an Indian dhoti. The tonga wallah had a note signed with the officer's name, promising him a reward in exchange for a lift back to camp. The captain denies everything. He is currently searching for the Section Eight G.I. who he claims cloaked his identity under the name of Shivers for his night of misadventure. 14TH AIR FORCE HQS. - Seven Japanese freighters, totaling 26,000 tons, were sent to the bottom of the South China Sea within two days this week by B-24 Liberators of the 14th Air Force. At the same time, other Liberators paid a visit to the east coast of French Indo-China, knocking out one railroad bridge and probably destroying another. In the Hengyang-Yangtze River sector P-40's attacked river shipping at Pengtseh and destroyed an 80-foot fuel barge, while other fighters caused several large explosions among warehouses at Hukow, southwest of Pengtseh. Hengyang airfield and Paishui were bombed by B-25's of the Chinese-American Composite Wing and a large number of Jap trucks were destroyed north of Lingling. Maj. Gen. Claire L. Chennault threw everything in the book at Kiyang and surrounding areas, with P-40's strafing steamers, troops and horses while B-25's and P-51's concentrated on railroad yards at Lingkwantien, causing severe damage. The ferry crossing at Kiyang was hit by fighter planes of the 14th Air Force, damaging both approaches. Mustang fighters and Mitchell bombers patrolled the Hengyang-Lingling area blasting away at everything in sight. A bridge northeast of Kiyang, road intersections, villages, troop concentrations, cavalry columns, river barges, all were strafed and bombed. Many fires were started and a considerable number of Japs and horses were left dead. Three buildings were destroyed at Lingling airfield by B-25's. Other B-25's rained explosives on Tien Ho and White Cloud airdromes in the Canton area, starting huge fires visible for 100 miles. Dog-fights between P-38's and Jap fighters were frequent over the Salween front. Two enemy planes were destroyed, one probable and three others damaged. From all of these operations, four of our aircraft failed to return. Chungking sources estimated that the Japanese were employing an estimated quarter of a million troops, aiming at three well-defined objectives in China this week. Primary objective, according to Army News Service, was Kweilin, advance bas of the 14th USAAF. Two Jap columns, one hitting southwest from Hengyang and the other northwest from Canton were converging towards the Kwangsi Province air base. 10TH A.F. HQ., INDIA - The "Red Gorilla" Squadron, fighter organization of the 10th Air Force boasts two mail clerks with the same name. One is Cpl. Thomas J. Henry of Brooklyn, who has been with the outfit two years, and the other is Cpl. Ernest Henry, of Hartford, Conn., a replacement. Comments the Brooklyn Henry, "It's all in the name. Just keep this new Henry around for a while until I'm rotated and the roster won't even have to be changed." Second objective was the clearing of the railway between Canton and Hankow, thus assuring the Nips a continuous supply route between North and South China. Third objective was the seaport of Wenchow in Chekiang Province, one of the two remaining seaports in Chinese hands. Foochow is the other port still held by the Chinese. The Kweilin drive showed the deepest penetration by enemy units of South China since the war started seven years ago. Starting from Hengyang, the Japs had smashed 110 miles along the Hunan-Kwangsi line in the first 10 days of their offensive. They covered 30 miles during 36 hours, with Lingling, described by Chinese sources as an advance American air base, being seized by an estimated five enemy divisions. At last reports, the enemy columns were less than 70 miles from Kweilin, with the main opposition coming from the stubborn sky warriors of Maj. Gen. Claire L. Chennault's 14th Air Force. Army News Service quoted Chinese sources as saying that the Japs were massing troops in Indo-China and drawing men from north and central China for their drive on the seaport of Wenchow. Enemy columns were hitting both from Canton in the south and Hankow in the north to join up in linking the railroad. Two years ago this week, Capt. (now Lt. Col.) Fred Eldridge paced nervously in front of the printing press at the New Delhi Statesman. Minutes later, the Roundup was born - and the former Los Angeles Times newshawk was a proud papa. A dream had reached fruition. That dream was Eldridge's; and even during the most desperate moments of the 1942 hike out of Burma with Gen. Joseph W. Stilwell, nothing failed to erase it. When Delhi headquarters was established and the general flashed the green light with the wire, "Let Eldridge have his paper," the captain wasted less time than Jesse Owens polishing off a 100-yard dash. Gen. Stilwell didn't stop with merely authorizing publication of the Roundup. Your CBI family journal, he announced, would be strictly G.I. in character. Brass hats would kindly observe a hands-off policy. The Roundup would constitute a "safety valve." Within the obvious bounds of discretion, it would present honest criticism, and no squawks at having your toes stepped on, please, if the editors have their facts correct. It would be circulated throughout the wide-flung CBI Theater, free of charge. 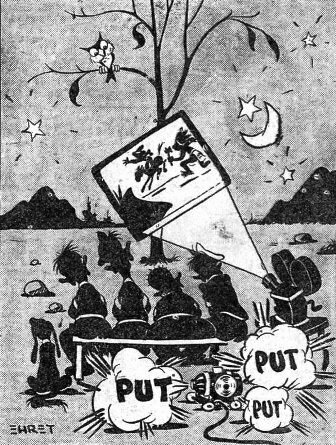 Today the Roundup staff, looking back objectively upon the first two years of the newspapers history, cannot fail to recognize and appreciate the extent to which the general's policy has enabled us to publish the gee-eyeist Theater journal in the Army. We've conducted numerous "campaigns," large and small, that would have alarmed a commander less understanding than Gen. Stilwell. We're proud to say we've won 'em all - duty exemptions up to $50 for packages home, shoes for a lad in China with oversized pedal extremities, false teeth for a G.I. subsisting on diet of mush. Worthy causes find a soft shoulder. You are acquainted, of course, with the Roundup's cheesecake policy. And our earnest effort to paint a picture of what all CBI units - ground, air and service forces - are accomplishing in our plan to kick the buck teeth of the Son of Heaven down his throat. And our presentation of the passing parade in Shangri-La - from the intricacies of the Presidential campaign to the latest shenanigans of Errol Flynn. And our coverage of the war fronts. Now the Roundup starts on Year III, retaining its established policy because we feel that's the way you want it. Capts. Floyd Walter and Crosby Maynard, Lt. William Sinclair, S/Sgt. Karl Peterson, T/3 John Derr, T/4 Arthur Heenan, T/4 Ralph Somerville and T/5 Charles Clark - the staff of the Roundup - hope you aren't going to cancel your subscription. The Complaint Department is two doors down the hall. The C.B.I. Roundup is a weekly newspaper of the United States Army Forces published by and for the men in China, Burma, and India, from news and pictures supplied by staff members, soldier correspondents, the United Press, OWI and Army News Service. The Roundup is published Thursday of each week and is printed by The Statesman in New Delhi, India. Editorial matter should be sent directly to Capt. Floyd Walter, Headquarters, U.S.A.F., C.B.I., New Delhi, and should arrive not later than Sunday in order to make that week's issue. Pictures must arrive by Saturday and must be negatives or enlargements. Stories should contain full name and organization of sender. 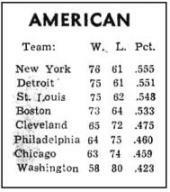 Original issue of C.B.I. Roundup shared by CBI veterans Bob Fagelson, Joe Brennan and Bill Tislow. Similar, better quality images of Sherry Britton and General Sultan substituted for those published in Roundup.